Each year, America’s leading professional construction and program managers deliver creative and innovative projects around the world. Many of these projects have a great story to tell. Regardless of size or complexity, successful projects represent lessons learned in our industry, and we want to know about them! 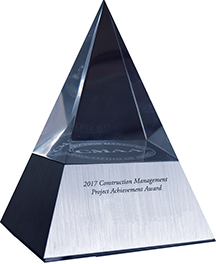 CMAA’s Project Achievement Awards program is the highlight of CMAA’s National Conference & Trade Show in the Fall. Our awards program highlights the best of the best, those projects that serve as an example to the industry, and are true pinnacles of excellence and innovation. Now is your time to shine. This year, the spotlight could be on you and your project team. Have you completed a project you’re very proud of? Do you want to recognize your project team’s commitment to excellence? Is your project an example of successful construction/program management? If the answer is yes, we invite you to compete for a 2019 Project Achievement Award. Organizations both large and small are invited to submit project nominations. Awards speak volumes about the level of service a firm provides. Here’s your chance to showcase your best work to the entire industry – and be part of a productive multi-tiered program honoring your accomplishments. Winners in all categories/market sectors will be showcased throughout the CMAA 2019 National Conference & Trade Show, in association news, press announcements, and social media. All submissions are due by June 3, 2019. Presentation of the awards will take place during the CMAA 2019 National Conference & Trade Show September 22-24, 2019 in Orlando, Florida. Our Mission is to promote the profession of construction management and the use of qualified construction managers on projects and programs. © 2019 CMAA. All rights reserved.